The bright Christmas star lingered over the Mabprachan reservoir on Boxing Day, casting its brilliant rays over the humble household of the Dibbayawan family. This was a sign informing family and friends that another celebration was taking place to commemorate the season of joy and giving. Guests arrived in droves. They were fellow members of the St. Nikolas Church congregation, neighbors and a group of Rotarians who came together to wish one and all ‘peace on earth and goodwill towards all of God’s children”. 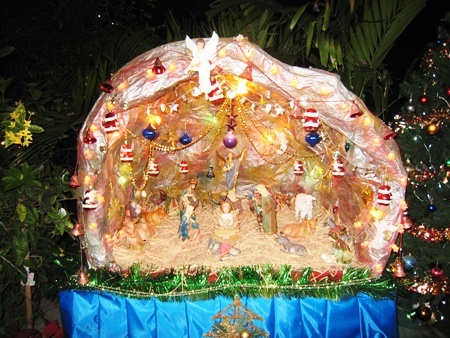 The exquisite hand crafted stable depicting the story of the birth of Jesus. At the entrance to Prem’s garden party, one couldn’t help but stop and admire the miniature model of the stable representing the birth place of Jesus of Nazareth. Meticulous attention was given to every detail of the sacred atmosphere as is described in the holy bible. There was Mother Mary and Joseph watching over baby Jesus in the manger. The three wise men who had traveled from afar to pay homage and bring gifts of gold, frankincense, and myrrh for the holy child. An angel kept guard from above and shepherds knelt in prayer as their flock of sheep lay about the stable. There were also some cows and donkeys as is quaint in a stable in old biblical days of yore. The whole scene gave one a sense of peace and wellbeing. Supanee, Prem’s loving and loyal wife was her ever charming self, exuding love and warmth to all that came to celebrate the holy day with her family. A lavish array of home-cooked meals ensured that visitors could feast to their hearts delight. 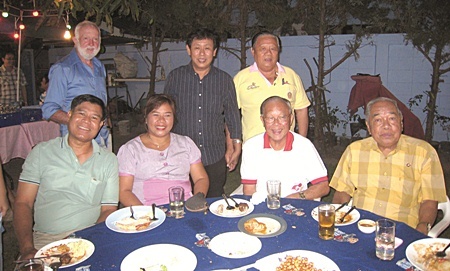 Amongst the revered guests attending the repast at Prem’s were Father Michael Weera, director of the Pattaya Orphanage and Father Francis Xavier Kritsada Sukkaphat, pastor of St. Nikolas church. It was surely not a night of gaudy shows or loud music, but a truly silent night as it should be to celebrate the night Jesus Christ the savior was born. By his sheer size, Petch is the centre of attention amongst his siblings. 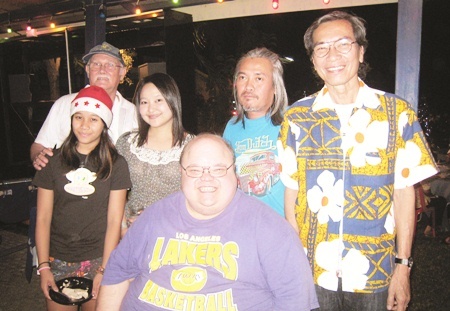 Members of the Rotary Club of Pattaya, Prem’s home club, came in force. 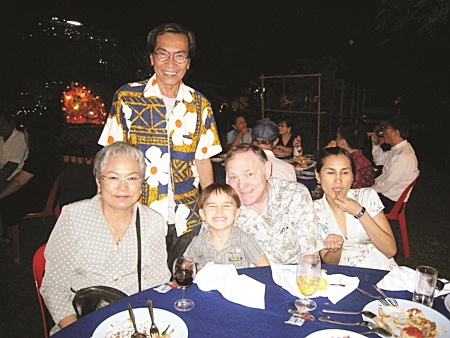 Ratana Yothawong with her Yamato family including the bubbly little Christian Suwanapoom Petersen. 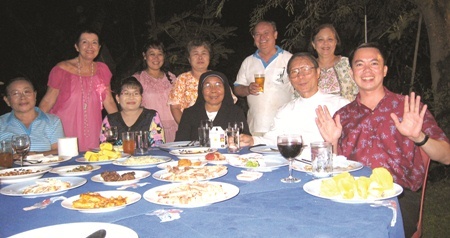 Premprecha and Supanee Dibbayawan (standing right) afford special attention to the holy delegation from St. Nikolas Church.